Learn the differences, similarities and causes between the two and how to handle water removal and cleanup. Whether you’re dealing with water damage or flooding, both can cause big problems and usually require professionals to perform water cleanup. Depending on the size and scope of your situation, your home may require water removal, flood repair or further restoration. While flooding caused by natural disasters or severe weather may be inevitable, there are some preventative measures you can take in and around your house to help slow the flow of water and/or help minimize the damage. The same goes for water damage – if you identify areas around the home that are more prone to water damage than others, you can take action to help prevent or at least decrease the amount and severity of the damage. Flooding can happen as a result of both natural and manmade causes, and it can affect the inside and outside areas of your home and property. During a very rainy season, yards can become oversaturated and if there isn’t adequate drainage, or if you have slow-draining soil, flooding is usually inevitable. Preventative measures – such as enhancing your yard’s soil composition and adding plants with deep roots and a high tolerance for water – are a good way to make your yard less susceptible to flooding. These measures can also minimize the amount of flood cleanup if you do experience heavy storms. Leaky or faulty appliances, burst pipes and water damage that’s not repaired in a timely manner are all non-weather related causes of flooding. Low-lying areas of a home – such as a basement or the foundation – are often more prone to flooding since they are at or below ground level and may experience rising waters from surrounding bodies of water (lakes, rivers, streams) that can overflow during heavy periods of rain. Also, basements oftentimes have multiple pipes running both under the ground and through the ceilings, making them vulnerable to flooding. Water damage is one of the results of flooding. 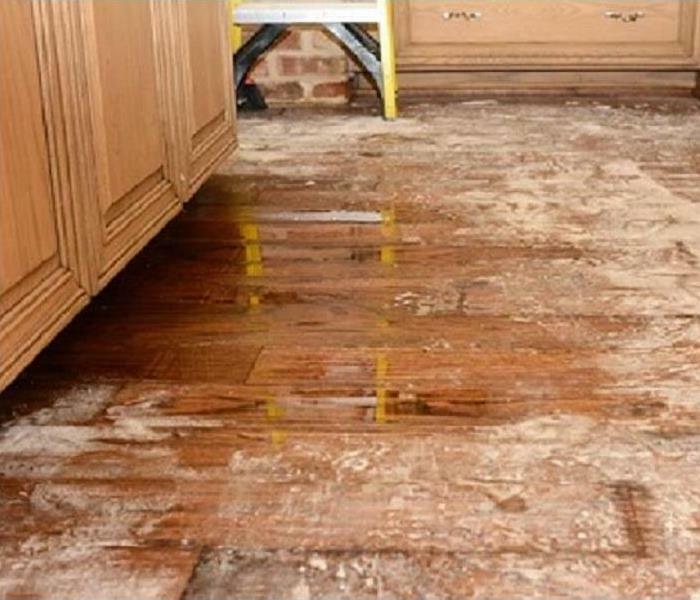 Even after water removal, the remnants of flooding can appear in the form of discoloration on walls, damaged flooring and mold growth. Common causes include leaky appliances, plumbing issues and heavy periods of rain. Homeowners can help avoid water damage to their homes by having several annual inspections. These include roof inspections (to detect leaks and other areas that may be vulnerable to penetration) and appliance checkups (to make sure they are all running properly and to replace any faulty parts). If left untreated, you will probably end up having to contact professional water cleanup services, like SERVPRO of The Saint Croix Valley, to properly address and repair any damage incurred. Flooding and water damage are both caused by natural sources such as heavy periods of rain/natural disasters and manmade sources like burst pipes and leaky or faulty appliances. Depending on the level and severity, both situations will usually require help from professional water cleanup services and/or flood repair. Flooding is usually an immediate occurrence that can happen in a matter of minutes or even seconds (think: a burst pipe or an overflowing toilet). Many insurance companies consider water damage and flood damage two different types of claims. While water damage is typically covered under most homeowners insurance, it’s important to carefully read over your policy, as some insurers may only cover certain types of water damage. If you have flooding or water damage on your hands, you’ll probably need the help of professional water cleanup services like SERVPRO of The Saint Croix Valley. We can handle the initial assessment/inspection, water removal and drying/containment, and help prevent further water damage throughout the entire water cleanup process. If your home or property requires restoration, you may have to contact a contractor to help with water damage/flood repairs in order to completely restore your home back to its original state. You’ll also want to get in touch with your home insurance company to report the damage and see if it’s covered under your policy. If a fire breaks out in your business, acting fast to put out the flames could save you from costly damage and loss. That's why commercial fire sprinkler systems are so important. Although sprinkler systems can protect you, your staff, your customers and your business from harm, myths about fire sprinklers still exist. 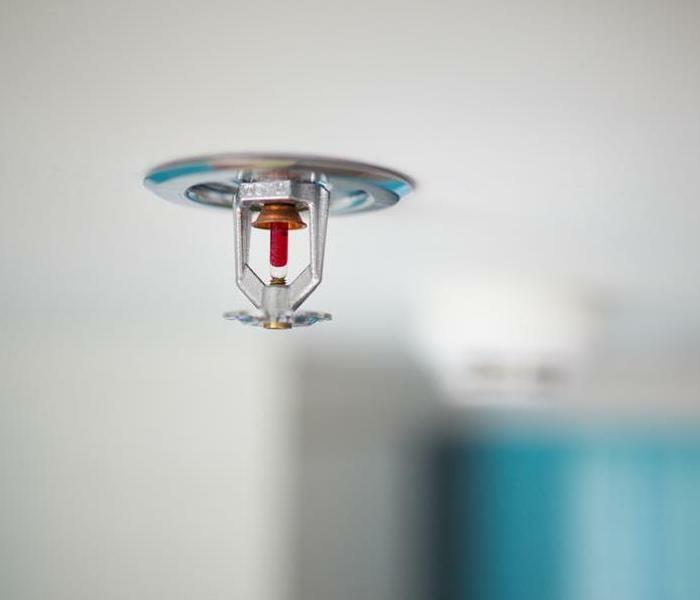 MYTH: Water damage caused by fire sprinklers is more costly than fire damage. FACT: According to the Federal Emergency Management Agency (FEMA), sprinkler systems are actually more cost-effective than damage caused by other firefighting efforts. Since sprinklers can keep a fire contained within one room rather than allowing the flames and smoke to spread throughout the building, most fire damage clean-up will only occur in one space. Furthermore, water damage from fire hoses is typically more expensive to repair. Quick-response sprinklers only release 8 to 24 gallons of water per minute, whereas fire hoses release 50 to 125 gallons per minute. MYTH: If one fire sprinkler is triggered, all fire sprinklers will go off. FACT: When one sprinkler in your commercial sprinkler system goes off, only the adjacent sprinklers that sense high levels of heat will activate. According to FEMA, this means that only one or two sprinkler heads will go off in the event of a fire. MYTH: Sprinklers are overly sensitive. FACT: Fire sprinklers only ever activate when high heat is detected, so an employee burning their lunch or taking a smoke break too close to the building will not set off the sprinkler system. According to FEMA, only 1 in 16 million sprinkler heads activate accidentally, making their benefits far outweigh any risks. As a business owner, safety and protection are important to keeping operations going smoothly. 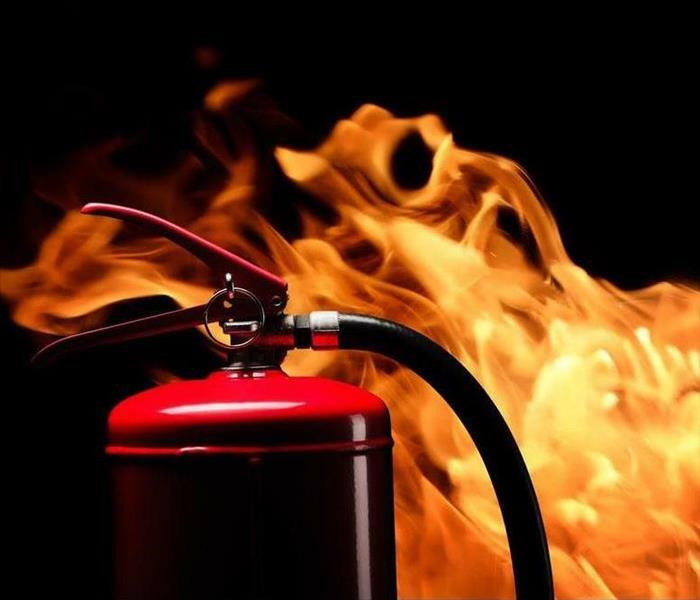 To help keep your company safe from any potential fire damage, install commercial sprinklers and place fire extinguishers throughout your facility. If the unexpected does happen, know that you're not alone. SERVPRO of The Saint Croix Valley is committed to being by your side every step of the way to get your business on its feet as quickly as possible. Use our fire and smoke damage clean-up services and our water damage clean-up services to get your doors back open fast. A leak in a commercial building can be costly. Not only could it cause thousands of dollars in damage and repairs, it could also shut down your company until the destruction can be fixed. To help prevent the worst from happening, use these tips to tackle plumbing maintenance in your building and ensure that you can keep business as usual. Inspect pipes regularly. A professional visual inspection of all pipes, faucets, toilet fixtures, and plumbing systems should be conducted at least quarterly. This can prevent plumbing failures before they become a serious issue. Upgrade pipes, faucets, and fittings that pose a risk to your commercial property. Updating old plumbing that can't handle high-volume usage can save you money in the long run. Pay close attention to your water heater and any filtration systems you have installed. These systems can cause big issues if they aren’t regularly maintained. Commercial water heaters, like residential ones, need regular maintenance to prevent leaks, system failures, and even explosions. Identify an action plan. If employees notice a leak anywhere in the building, they should know to whom to communicate the issue, who should be responsible for shutting off water valves, and where important water systems are located throughout the building. Create an emergency contact sheet. This list should be easily accessible to all employees within the building. Include contact information for plumbers, building supervisors, other tenants, water mitigation damage services, and other people you may need to reach in case of emergency. Protect your data. Business owners should have data backed up to an external hard drive or a cloud-based system to ensure all assets are protected in an emergency. Determine off-site work locations. If the building has to close until repairs are complete, you may need to work remotely to keep business running. Employees and customers should be notified of temporary workspaces and working hours. Turn the water off in that area or at the main shutoff valve. This can stop the immediate problem until repairs can be made. Block entry to and use of the area. Even slow leaks from faucets or toilet fixtures can become serious issues, especially in high-use areas like commercial buildings. Call your plumber to make repairs. Use your emergency contact sheet to notify everyone who needs to be aware of the issue, and try to get the plumber there as soon as possible. Once the issue is resolved, you may be left with damage. Call a reputable restoration company, like SERVPRO to get your business back on its feet as quickly as possible. Leaks come in all shapes and sizes. With a little bit of education you can be better prepared for when they do happen. It only takes a small leak in a commercial building to cause extensive water damage. The longer the leak goes unnoticed, the more damage you can expect. Any building can spring a leak. But commercial buildings are put under quite a bit more stress than residential buildings, with heavy use of bathrooms, kitchens and other water-intensive processes. Learn about the most common types of leaks found in commercial buildings, and what you can do to fix them. Every faucet has components that can wear out over time, especially with frequent use. When a seal or other faucet component begins to leak, it leads to ongoing water loss. When the drip becomes a trickle or a flow, water loss can be extensive and your water bill can substantially increase. Toilets have a number of parts that can wear and lead to issues, especially water loss. For example, a flapper that fails to create a solid seal will allow water to leak from the toilet tank drain. If leaks like these aren’t repaired as soon as possible, you may experience additional damage to other toilet components, your water bill may increase significantly, and you may eventually have to replace the entire toilet to remedy the problem. Items like sewer drains, water supply pipes, or other buried piping systems require water leak detection equipment to help locate any leaks. If found, pipes can be dug up and repaired. If not, exploratory digging may be necessary to find the source of the leakage. A leak can hide anywhere in a commercial building. If the leak is not discovered early, the amount of water loss and damage caused may be extensive. Once the leak is identified, it may require pulling out walls, ceilings, and other major pieces of the building to fix the leak and repair the damage. Installing a leak detection system can make it much easier to identify potential leaks and address them as quickly as possible. These systems can be extremely beneficial in commercial buildings, as they allow for the creation of a building-wide detection system. Technology offers some exciting innovations in leak detection. Wireless water leak detectors can communicate by phone, text, and email when a leak is detected. Cloud-based sensors are also available that integrate with a portal where you can monitor all sensors in a system. There are even automated sensors which can shut off water in certain applications. If you are unsure which type of water leak detection equipment is best for your building, consult a contractor before installation. If you suspect a leak in your business, contact SERVPRO of The Saint Croix Valley. We are here to help, 24 hours a day, seven days a week. 715-381-2266. How Long Does it Take to Repair a Home After a Fire? Dealing with a home fire can be overwhelming. It takes time, money, and oftentimes unexpected factors arise that are almost always out of your control. While each restoration job is unique, it’s important to understand the general process and how long each phase can take. First, the mitigation vendor will come out to assess the level of damage in the home. The affected rooms will be tested for soot and smoke damage by using special sponges or gloves, and a high-efficiency particulate air (HEPA) vacuum and deodorizer will be used to clean the air. The mitigation vendor will also explain what the demolition and rebuild phase may consist of (if applicable) and determine whether it makes sense to do more complex tasks such as flood cutting, a process that determines the water accumulation in drywall, or tearing down walls and ceilings, and removing floors. These tasks may be necessary when a severe fire occurs as water damage can occur from extinguishing the fire. Lead and asbestos testing may also take place depending on the state the house is in and the year it was built. The general contractor often takes on subcontractors to rebuild other parts of the home, such as installing flooring or drywall (or uses an architect for larger losses), so you can get the type of flooring, roofing, etc., you want in your newly restored home. When all work is complete, you and your contractor will perform a final walk through to review the repairs and you will be asked to sign a Certificate of Satisfaction, which is documentation needed to close out the job. 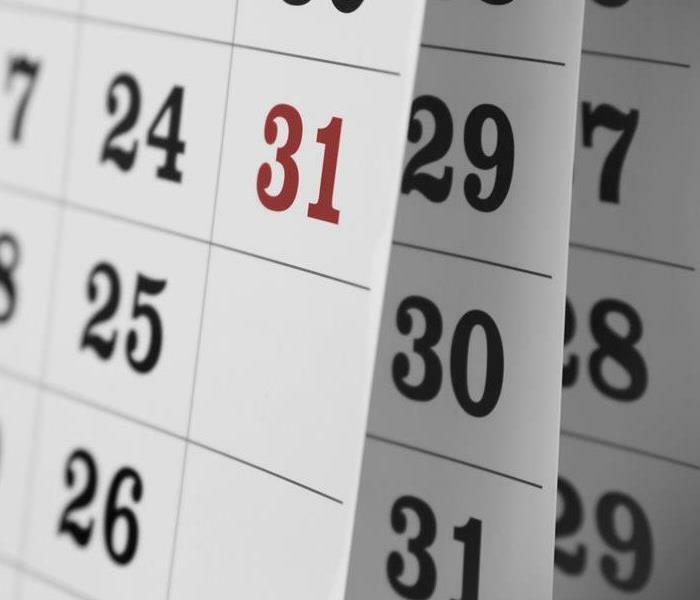 Remember, there’s no one-size-fits-all time estimate for the restoration process. It depends on the size of the house, severity of damage and vendors involved. A small house with light damage could be fixed in a couple of days, whereas a larger job requiring a full gut (or complete rebuild) could take six months or more. It’s always helpful to ask for a scope of the work involved as well as an estimate, so you have a better sense of what to expect for your specific situation. Permits can prevent demolition from happening. For example, you may have to hold off on a rebuild if the building fails lead or asbestos testing. Hire a trustworthy mitigation vendor, like SERVPRO of The Saint Croix Valley, with proper credentials and good reviews. If the mitigation is not done well, it can create more work for the general contractor. Avoid cleaning prior to speaking with a professional company, as it could cause further damage. Collect all sentimental items to handle/clean yourself to avoid potential accidents while professionals are there. If you have experienced fire damage to your home, it’s important to begin the restoration process as soon as possible. SERVPRO of The Saint Croix Valley is a qualified fire restoration company from its nationwide network to help restore your home from beginning to end. WE are just a phone call away, 24 hours a day, 7 days a week, 715-381-2266. Labeling your water shut-off valve is an excellent way for it to be identified in case of an emergency. As a homeowner, it's essential to know where the main water shut off valve is located. Water leaks from running toilets, burst pipes, broken water heaters, and even leaky sinks can cause significant damage in a short amount of time. In order to prevent costly damage, turn off the water supply as soon as a leak, flood, or spill occurs. When Do I Need to Shut Off My Main Water Line? Typically, you won't have to go directly to the main water line to fix a leak. Instead, your first attempt at stopping your water supply should be straight at the source. Most local supply lines have valves located directly behind or above the fixture and can be turned clockwise to shut off the water supply. For sinks, look under the cabinet on the supply lines leading to the faucet. There will likely be two shut-off valves to control both cold and hot water. For toilets, look close to the ground behind or beside the toilet, along the flexible metal tubing leading to the tank. For washing machines, look either directly above the washer or pull the machine away from the wall and check behind it. For water heaters, the water valve should be located just above the heater itself. If the leaky fixture's valves aren't working or break off, turn off your main water line right away. Acting fast could save you plenty in damages and repair costs. How Do I Find My Main House Water Shut Off Valve? The main water line valve to a house is usually located in the basement or in the crawlspace and enclosed behind an access panel. However, there isn't a standard location specified in any home. The valve will often be located on-grade, so you'll likely find it at floor-level in the basement or near the ground on the first floor. Take a look at the property inspection report provided when you purchased your home. This report should note the location of the valve. 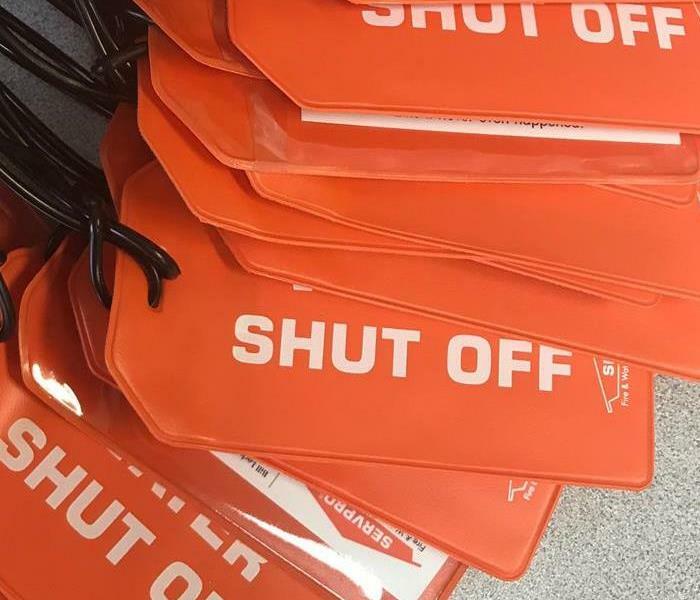 At SERVPRO of The Saint Croix Valley, we know how terrifying it can be to try shutting off your supply lines just to see the valves stick in place – or worse, snap off in your hands. That's why we recommend periodically checking your shut off valves to ensure they're in good working condition. At least twice a year, test all the valves in your home. Simply turn them completely off and on again to ensure they aren't stuck in place or include faulty parts. That way, if an emergency ever does occur, you can have peace of mind that you'll be able to fix the problem quickly and efficiently. If the unexpected happens and you aren’t able to shut off your water valves in time, call on the experts at SERVPRO of THE SAINT CROIX VALLEY. Our water damage restoration services can help you get your home back to normal as quickly as possible. With the proper tools and knowledge, we'll work fast and efficiently to prevent additional water damage, cleanup costs, and overall stress. Heating equipment is the second leading cause of home fires in the United States. More than 65,000 home fires are attributed to heating equipment each year. These fires result in hundreds of deaths, thousands of injuries and millions of dollars in property damage. 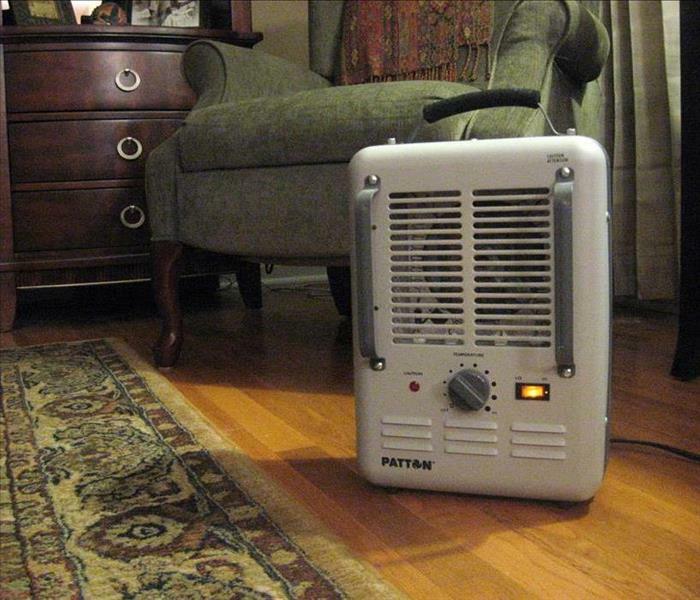 Portable electric space heaters can be a convenient source of supplemental heat for your home in cold weather. Unfortunately, they can pose significant fire and electric shock hazards if not used properly. Fire and electrical hazards can be caused by space heaters without adequate safety features, space heaters placed near combustibles, or space heaters that are improperly plugged in. Make sure your space heater has the label showing that it is listed by a recognized testing laboratory. Before using any space heater, read the manufacturer’s instructions and warning labels carefully. Never leave a space heater unattended. Turn it off when you're leaving a room or going to sleep, and don't let pets or children play too close to a space heater. Space heaters are only meant to provide supplemental heat and should never be used to warm bedding, cook food, dry clothing or thaw pipes. Install smoke alarms on every floor of your home and outside all sleeping areas and test them once a month. Proper placement of space heaters is critical. Heaters must be kept at least three feet away from anything that can burn, including papers, clothing and rugs. Locate space heaters out of high traffic areas and doorways where they may pose a tripping hazard. Place space heaters on level, flat surfaces. Never place heaters on cabinets, tables, furniture, or carpet, which can overheat and start a fire. Always unplug and safely store the heater when it is not in use. Fire can be a destructive force, but with a little prevention, you can cut down your risks. As we are in to the season of turning on furnaces and starting space heaters, the chance of having a fire increase greatly. In just two minutes, a fire can become life-threatening. In five minutes, a residence can be engulfed in flames. Here are some steps to help if a fire should break out in your home or business. At SERVPRO of The Saint Croix Valley we have the ability to help start the recovery process of your property, your home, and your life after fire affects you. In the unfortunate event that you have a fire, please call us and let us show you how we can help you. 715-381-672. OH THE DAMAGE A DISHWASHER CAN DO! This isn't ever a pleasant sight to find but, with a little knowledge this won't have to put you through the "rinse cycle!" Dishwashers are great, but also encompass great water damage potential. Imagine a dishwasher breaking down while working, all full of water. The amount of water flowing would be overwhelming, especially since in most cases the water keeps flowing as the dishwasher doesn't stop the water flow. While in most cases a dishwasher failing causes only a small water flood, in more complex cases the damage goes far beyond just blotting the water. In some cases, that dishwasher will really be disruptive to your daily routine. You're getting ready for work. You put all the dishes in the dishwasher, hit the start button, pick up your keys from the counter, and you and the kids are out the door off to another regular day. Or at least the beginning of a regular day. With the workday behind you, you go home to get the house prepared for another afternoon of fun & kids. You open the door, walk to the kitchen, and see a big puddle of water next to the dishwasher. Uh oh. Bad sign #1. You check the dishwasher, and see it's off now. The water isn't running anymore. But the water traveled around the kitchen. And all the way to the basement stairs. You walk over, only to see the water spilled down the stairs. How long has the water been standing there? And how are you going to handle the water now? If you have water damage, either from a dishwasher or other water sources (leaky pipes, for example) the remediation process is quite similar - stop the water flow, call the experts, get the water out, dry the area and fix the damage. The sooner you find out about the water leaks, the easier it is to restore your property and clean up the mess. If your dishwasher just broke, and you closed the water immediately, you may not have even suffered from minor water damage yet. But if your water heater broke sometime last night, and you only just found out - your water heater just caused a lot of water damage. Same goes for the case mentioned above - as one of our customers found out. Dishwasher Breakage Taking Down the House. Almost. The dishwasher leaked all the way to the basement. The basement ceiling got wet, the kitchen floor got soaked, and the basement's carpets got drenched as well. Getting the water out was not a simple task, but we got it done. We used professional water extraction machines to get all the excess water out of the kitchen and basement. After we got rid of the water, we started the drying process - removing all items that could not be restored to preloss condition and drying them, placing air movers and dehumidifiers to dry the floors and ceiling and eventually fixing the parts of the drywall that got removed as well. It wasn't a simple job, but we had it done in 10 days. It was more than we thought it would take, but the water from that dishwasher went as far as it could and caused big damage. 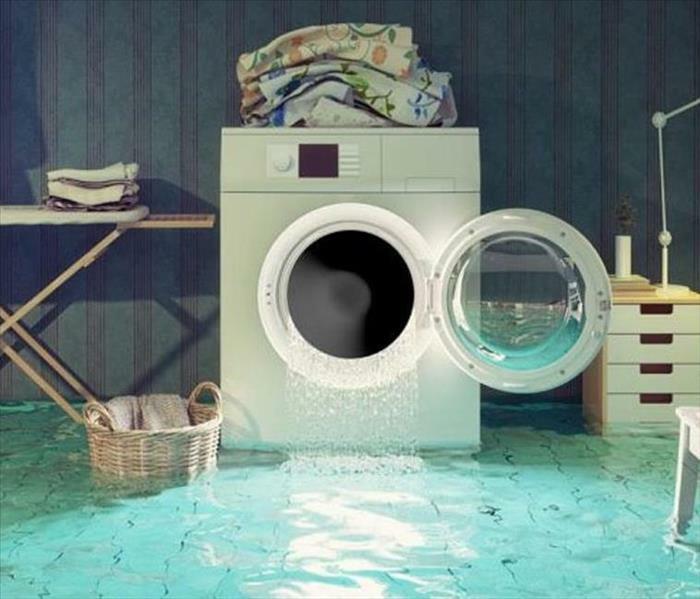 Never underestimate the power of water, especially when it comes to water damage and your home. If your home is flooded, the first 24 to 48 hours are critical because this is all the time mold and other microorganisms needs to begin growing and thriving. Organic food source, especially cellulose (e.g., paper, wood), which are found in abundance in construction materials. Time – several hours to several days. Water damage restoration has two main goals. First, to restore the home to preloss condition. Second, to prevent the onset of mold and other microorganisms. In order to accomplish these goals, you need to take action immediately. These are the action steps. Contact a restoration contractor immediately to begin the removal of excess water. Once the excess water is removed, the restoration contractor can deploy drying equipment, dehumidifiers, and air movers, which will be effective at preventing mold growth. Contact your insurance company to begin the claims process. The other reason time is not on your side relates to the bio-hazard level of the water. There are three hazard levels. Category 1 Water, also known as clean water, is not considered hazardous because it originated directly from a sanitary source such as a broker water supply line, melting ice or snow, rain water, and/or uncontaminated tub or sink water. Category 2 Water, also known as gray water, is a health concern because the water originated from a contaminated source such as discharge from dishwashers or washing machines, toilet bowl overflows (urine, no feces), seepage due to hydrostatic pressure, and sump pump failures. Gray water has bacteria present that carry nutrients for microorganisms that cause sickness and discomfort when consumed. Category 3 Water, also known as black water, is the worst level of water contamination because the water originated from sewage, rising flood water from rivers and streams, and ground surface water flowing horizontally into the home. Black water can cause death and sickness because it can be contaminated with E. coli; Acanthamoeba; Salmonella; Helicobacter pylori; Leptospira; Cryptosporidium; Giardia; Hepatitis A Virus; Clostridium Tetani; and Adenoviridae. Illnesses caused by black water include gastroenteritis; Weil’s disease also known as Leptospirosis; Hepatitis; acute respiratory illnesses; and tetanus. The problem with standing flood water is that the risk of bio-hazard increases as time passes. In short, after two to three days, clean water can turn to gray water, and eventually black water as bacteria and pathogens begin to grow and proliferate. The immediate inclination of most property home owners is to begin the clean-up process themselves and if you do, please take precautions because micro-organisms enter the body through direct contact or by breathing in contaminants. For this reason, always wear protective clothing, rubber boots, gloves, eye, and respiratory protection. In order to avoid long term health, structural, and mold concerns, we recommend the services of a professional restoration company that has the experience and training to restore your home to preloss condition. Well trained professionals understand that not all water damage restoration projects are the same. When they are formulating their action plan also known as a scope of work, they will assess the hazard level of the water, but will also determine the extent of water damage to create a sensible plan of action. 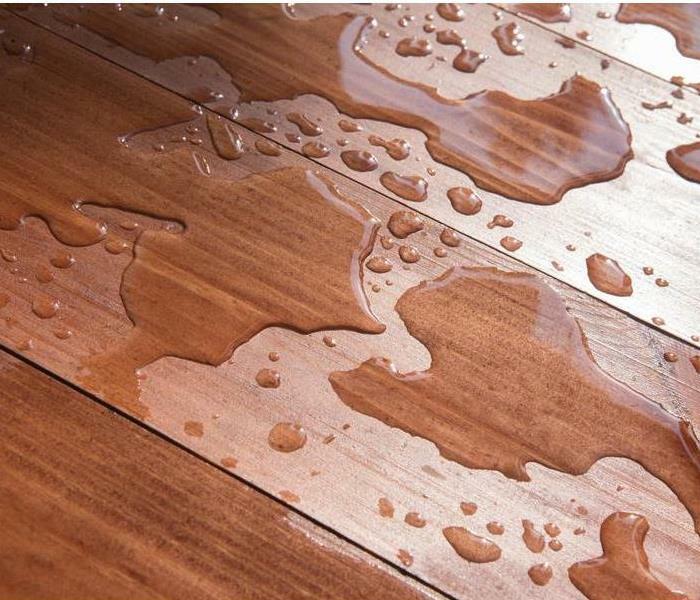 Class 1 Water Damage: The lowest and easiest to deal with, this has a slow evaporation rate. Only part of a room or area was affected, there is little or no wet carpet, and the moisture has only affected materials with a low permeance rate, such as plywood or concrete. Class 2 Water Damage: With a fast evaporation rate, this level affects an entire room, carpeting, or cushioning, the wetness has wicked up the walls at least 12”, and there is moisture remaining in structural materials. Class 3 Water Damage: This class has the fastest evaporation rate, and ceilings, walls, insulation, carpet and sub-floors are all saturated. The liquid may have come from overhead. Class 4 Water Damage: This class is labeled as a specialty drying situations, which means there has been enough liquid and time to saturate materials with very low permeance, such as hardwood, brick, or stone. Trained professionals have specialized equipment to pump out excess water, commercial grade dehumidifiers and air movers. Experienced professionals have the knowledge to properly determine the class of water damage and category of water to put together a scope of work (ie. plan of action). Ability to assess structural issues caused by the water damage, which could have long term safety and property value consequences if not fixed properly. Advise you on what contents can be cleaned and what needs to be thrown out. Create a drying and monitoring strategy using air movers and dehumidifiers. Create a sanitizing plan to ensure a healthy living environment. As a final note, in addition to using the services of a professional restoration company, we also recommend that you hire a third party environmental firm to perform post-remediation verification tests on the air quality to assess the mold spore count and sewage contamination tests if the flood water had category 3 water. These tests should be performed before any reconstruction occurs because it will provide you with verification that the water damage restoration was done properly. There is a cost to post-remediation verification, but it is well worth the investment for peace of mind that the work was done properly. Long term, this final step could save you thousands of dollars and future headaches because if any moisture or bacteria is present after the rebuild is complete, much of the reconstruction will eventually need to be torn down, particularly if there is mold. 1/18/2019 - How Long Does it Take to Repair a Home After a Fire? 10/2/2018 - OH THE DAMAGE A DISHWASHER CAN DO!